Your last gift. 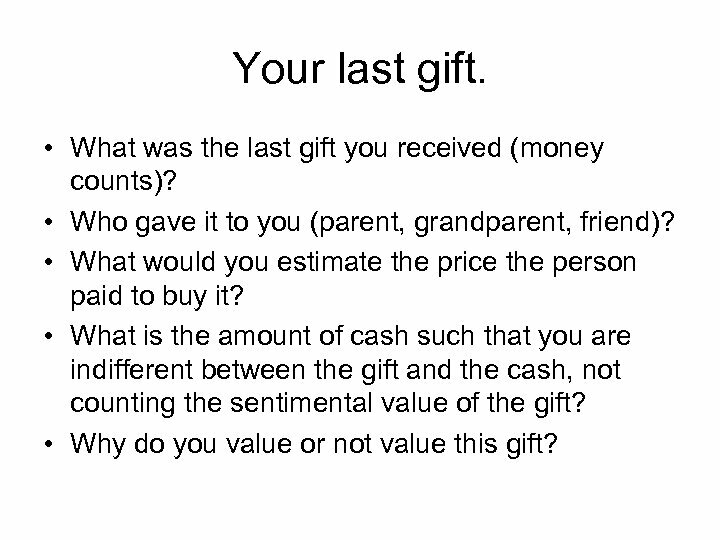 • What was the last gift you received (money counts)? • Who gave it to you (parent, grandparent, friend)? • What would you estimate the price the person paid to buy it? • What is the amount of cash such that you are indifferent between the gift and the cash, not counting the sentimental value of the gift? • Why do you value or not value this gift? 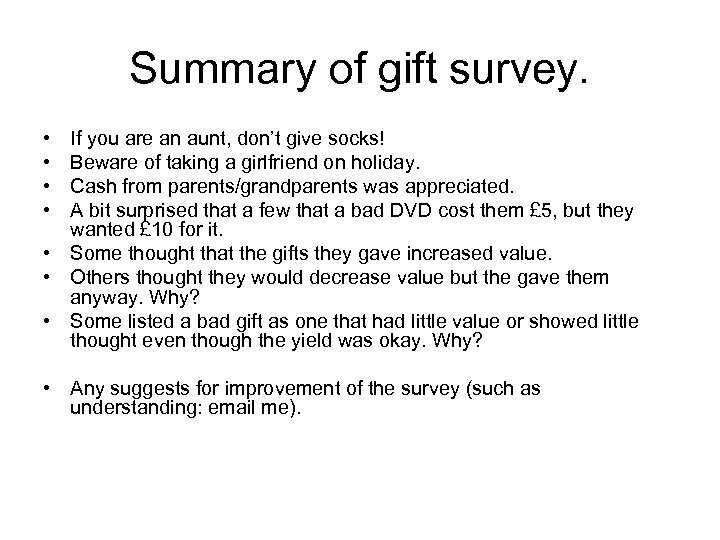 Summary of gift survey. • • If you are an aunt, don’t give socks! Beware of taking a girlfriend on holiday. Cash from parents/grandparents was appreciated. A bit surprised that a few that a bad DVD cost them £ 5, but they wanted £ 10 for it. • Some thought that the gifts they gave increased value. • Others thought they would decrease value but the gave them anyway. Why? 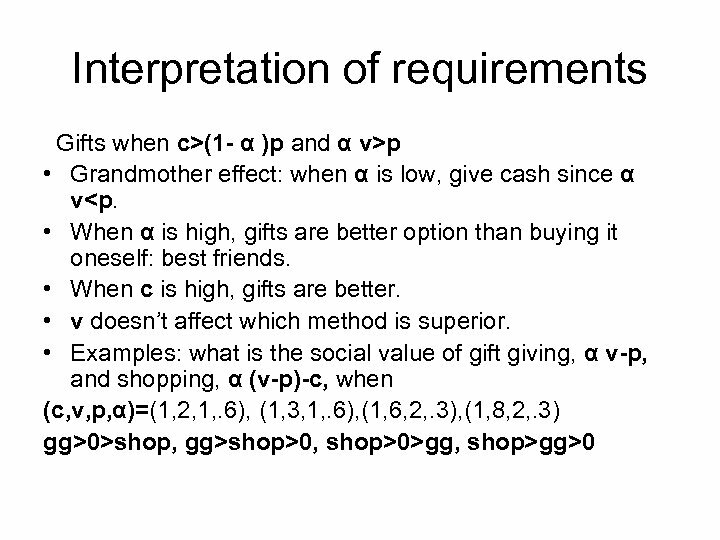 • Some listed a bad gift as one that had little value or showed little thought even though the yield was okay. Why? • Any suggests for improvement of the survey (such as understanding: email me). 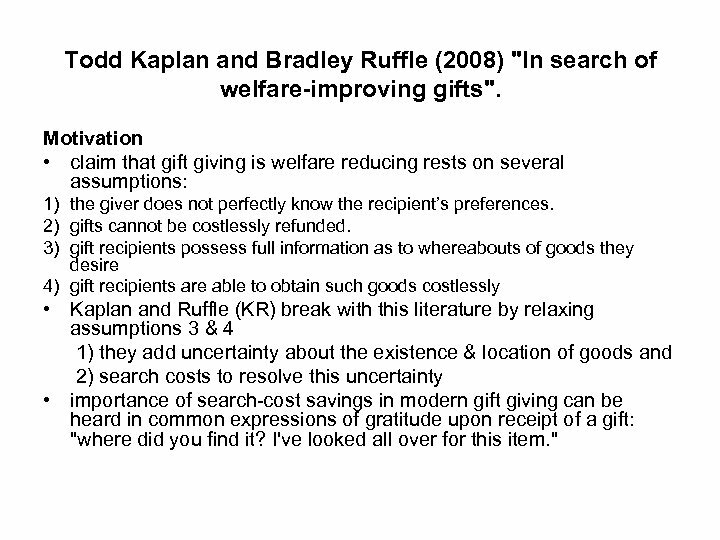 Todd Kaplan and Bradley Ruffle (2008) "In search of welfare-improving gifts". 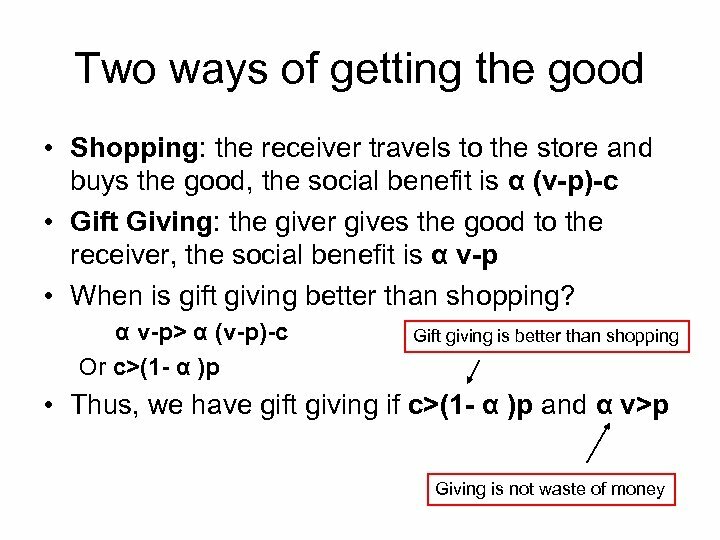 Motivation • claim that gift giving is welfare reducing rests on several assumptions: 1) the giver does not perfectly know the recipient’s preferences. 2) gifts cannot be costlessly refunded. 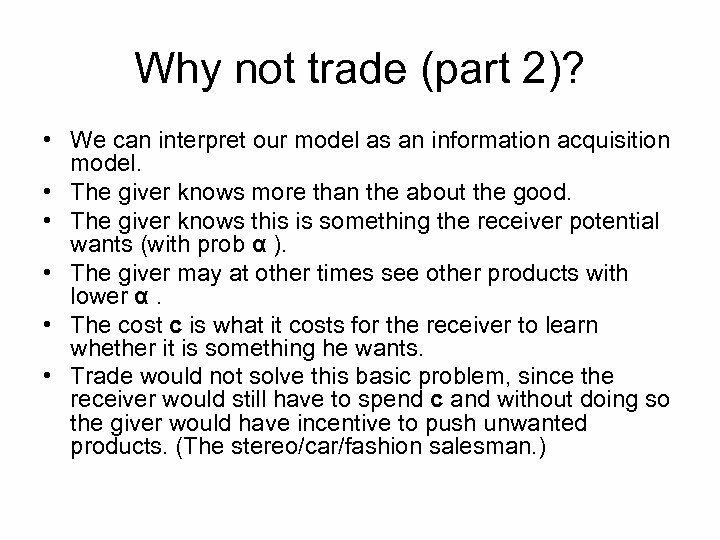 3) gift recipients possess full information as to whereabouts of goods they desire 4) gift recipients are able to obtain such goods costlessly • Kaplan and Ruffle (KR) break with this literature by relaxing assumptions 3 & 4 1) they add uncertainty about the existence & location of goods and 2) search costs to resolve this uncertainty • importance of search-cost savings in modern gift giving can be heard in common expressions of gratitude upon receipt of a gift: "where did you find it? I've looked all over for this item. " 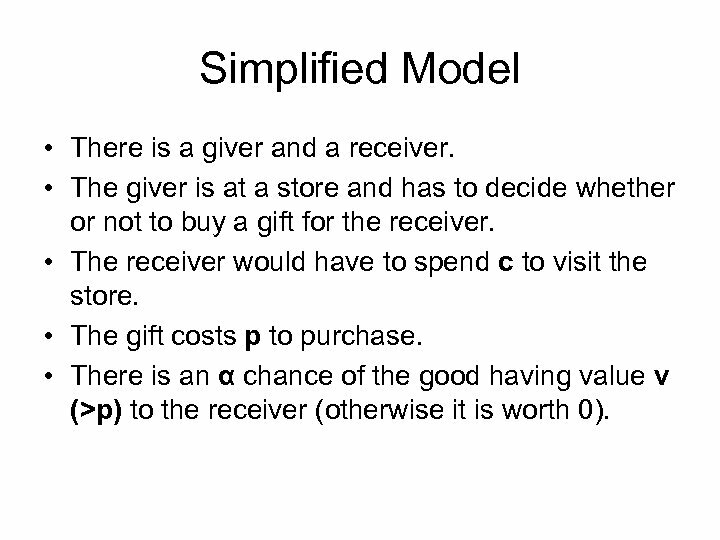 Simplified Model • There is a giver and a receiver. • The giver is at a store and has to decide whether or not to buy a gift for the receiver. • The receiver would have to spend c to visit the store. • The gift costs p to purchase. 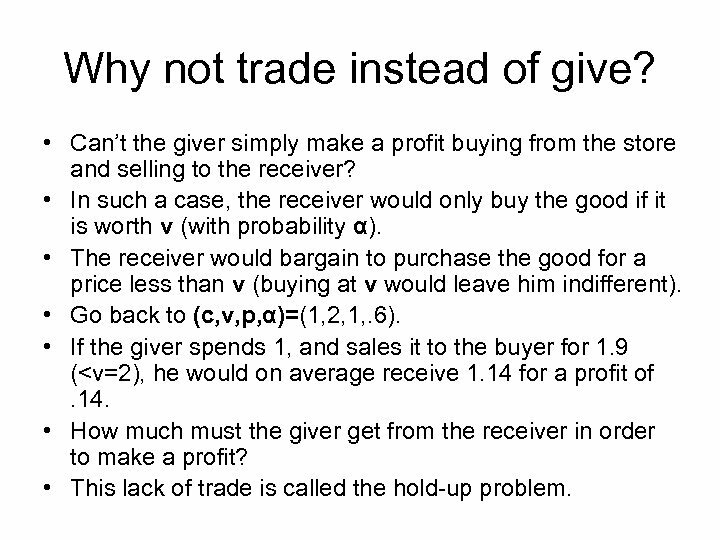 • There is an α chance of the good having value v (>p) to the receiver (otherwise it is worth 0). 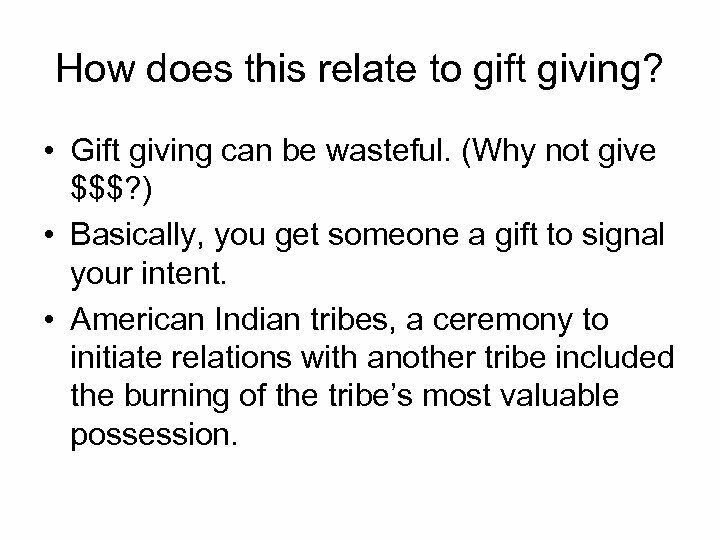 Why is gift giving still made? 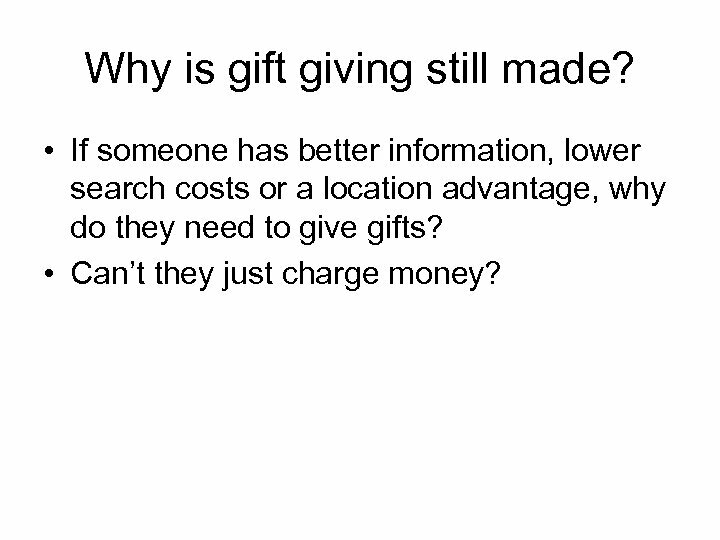 • If someone has better information, lower search costs or a location advantage, why do they need to give gifts? • Can’t they just charge money? 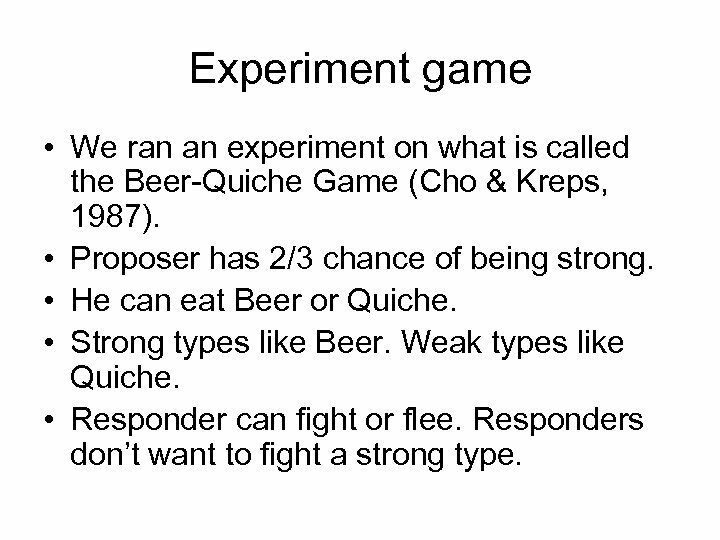 Experiment game • We ran an experiment on what is called the Beer-Quiche Game (Cho & Kreps, 1987). • Proposer has 2/3 chance of being strong. • He can eat Beer or Quiche. • Strong types like Beer. Weak types like Quiche. • Responder can fight or flee. Responders don’t want to fight a strong type. Signalling in the Lab: Treatment 1 Payoffs: Proposer, Responder Flee Fight Beer (Strong) $2. 00, $1. 25 $1. 20, $0. 75 Quiche (Strong) $1. 00, $1. 25 $0. 20, $0. 75 Beer (Weak) $1. 00, $0. 75 $0. 20, $1. 25 Quiche (Weak) $2. 00, $0. 75 $1. 20, $1. 25 • Responder now knows that Beer is the choice of the strong type and Quiche is the choice of the weak type. 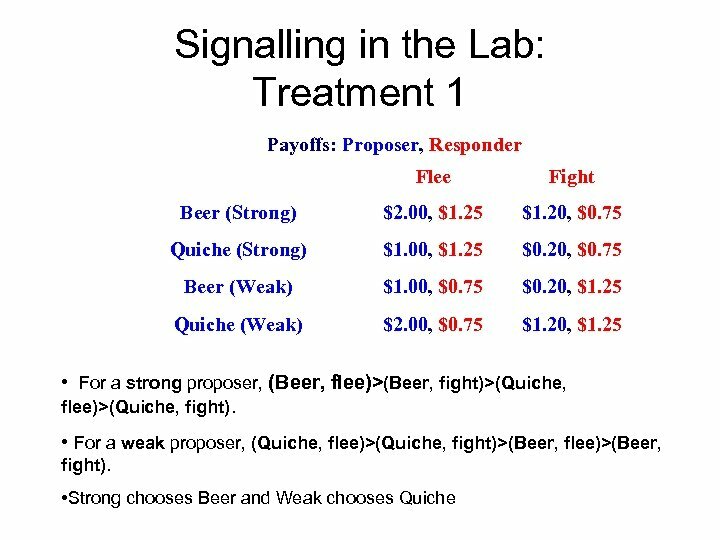 • For Beer he flees, for Quiche he fights. 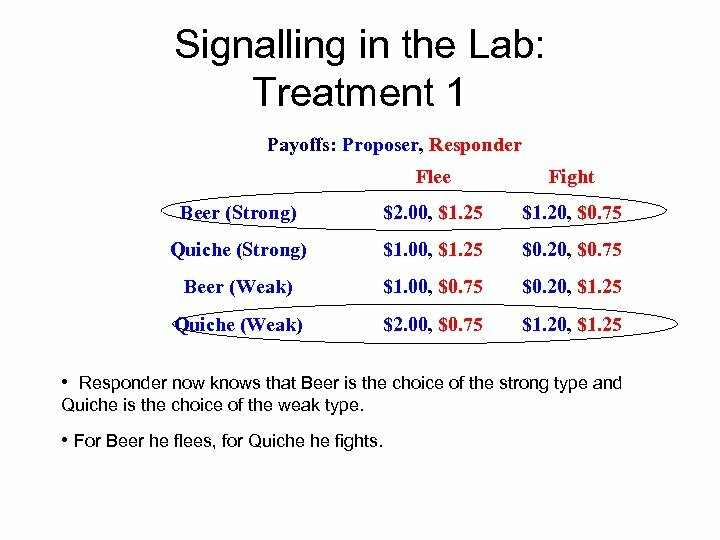 Signalling in the Lab: Treatment 1 Payoffs: Proposer, Responder Flee Fight Beer (Strong) $2. 00, $1. 25 $1. 20, $0. 75 Quiche (Strong) $1. 00, $1. 25 $0. 20, $0. 75 Beer (Weak) $1. 00, $0. 75 $0. 20, $1. 25 Quiche (Weak) $2. 00, $0. 75 $1. 20, $1. 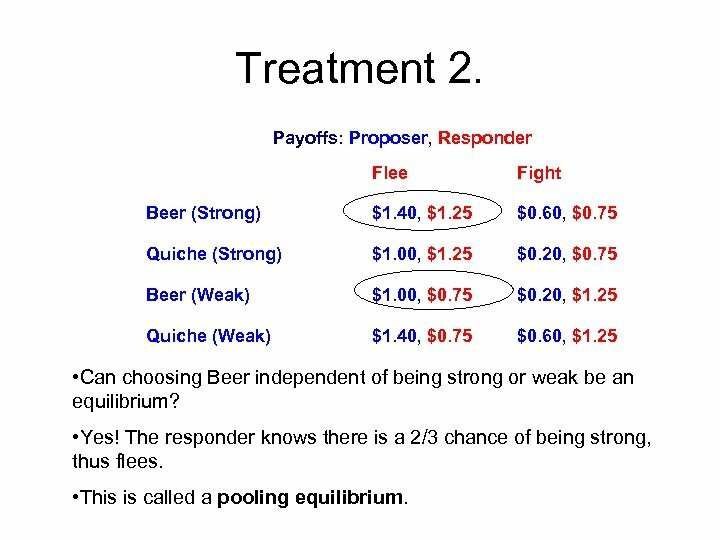 25 • So the equilibrium is • For strong, (Beer, Flee) • For weak, (Quiche, Fight) • This is called a separating equilibrium. • Any incentive to deviate? Treatment 2. 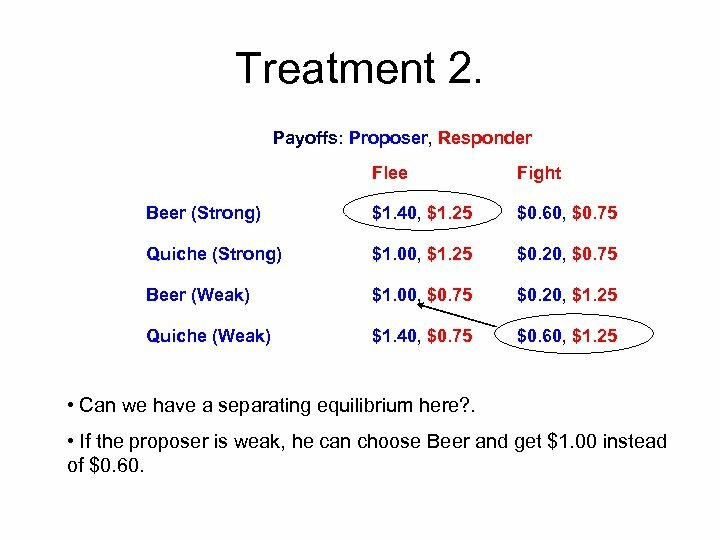 Payoffs: Proposer, Responder Flee Fight Beer (Strong) $1. 40, $1. 25 $0. 60, $0. 75 Quiche (Strong) $1. 00, $1. 25 $0. 20, $0. 75 Beer (Weak) $1. 00, $0. 75 $0. 20, $1. 25 Quiche (Weak) $1. 40, $0. 75 $0. 60, $1. 25 • Can we have a separating equilibrium here? . • If the proposer is weak, he can choose Beer and get $1. 00 instead of $0. 60. Treatment 2. 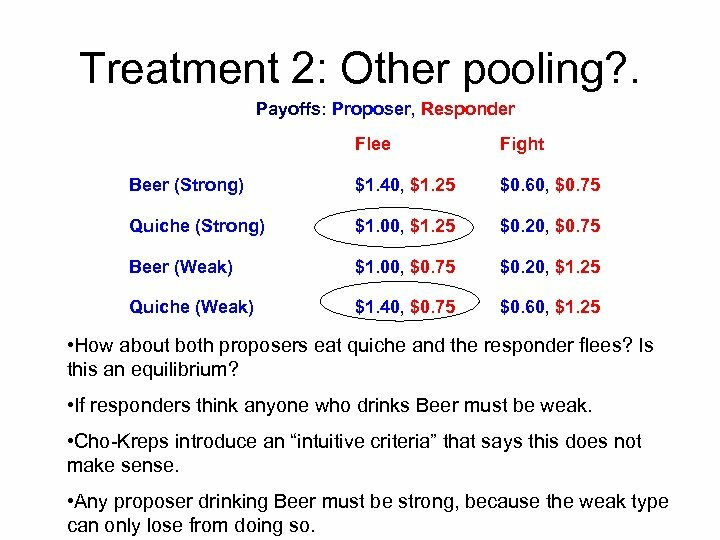 Payoffs: Proposer, Responder Flee Fight Beer (Strong) $1. 40, $1. 25 $0. 60, $0. 75 Quiche (Strong) $1. 00, $1. 25 $0. 20, $0. 75 Beer (Weak) $1. 00, $0. 75 $0. 20, $1. 25 Quiche (Weak) $1. 40, $0. 75 $0. 60, $1. 25 • Can choosing Beer independent of being strong or weak be an equilibrium? • Yes! The responder knows there is a 2/3 chance of being strong, thus flees. • This is called a pooling equilibrium. Treatment 2. Payoffs: Proposer, Responder Flee Beer (Strong) $1. 40, $1. 25 Quiche (Strong) $1. 00, $1. 25 Beer (Weak) $1. 00, $0. 75 Quiche (Weak) $1. 40, $0. 75 Fight 4 $0. 60, $0. 75 30 3 $0. 20, $0. 75 $0. 20, $1. 25 $0. 60, $1. 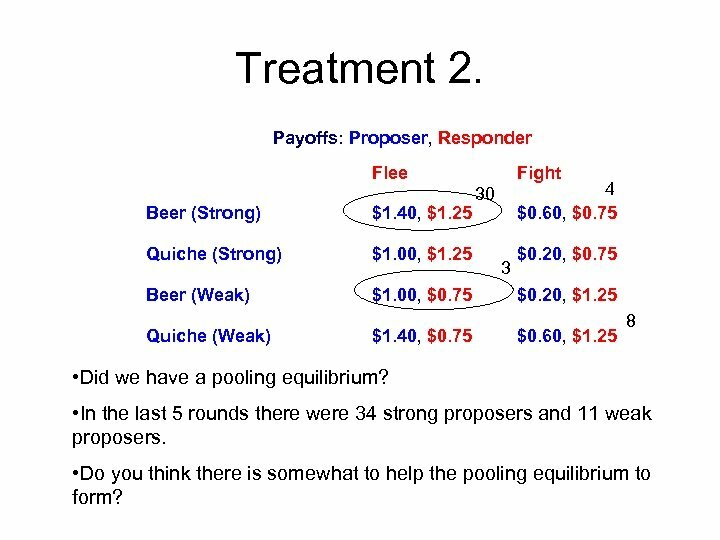 25 8 • Did we have a pooling equilibrium? • In the last 5 rounds there were 34 strong proposers and 11 weak proposers. • Do you think there is somewhat to help the pooling equilibrium to form? 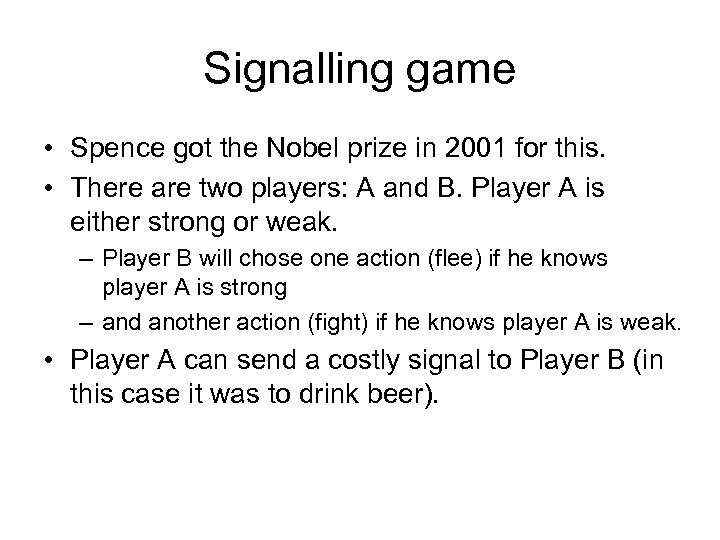 Signalling game • Spence got the Nobel prize in 2001 for this. • There are two players: A and B. Player A is either strong or weak. – Player B will chose one action (flee) if he knows player A is strong – and another action (fight) if he knows player A is weak. • Player A can send a costly signal to Player B (in this case it was to drink beer). 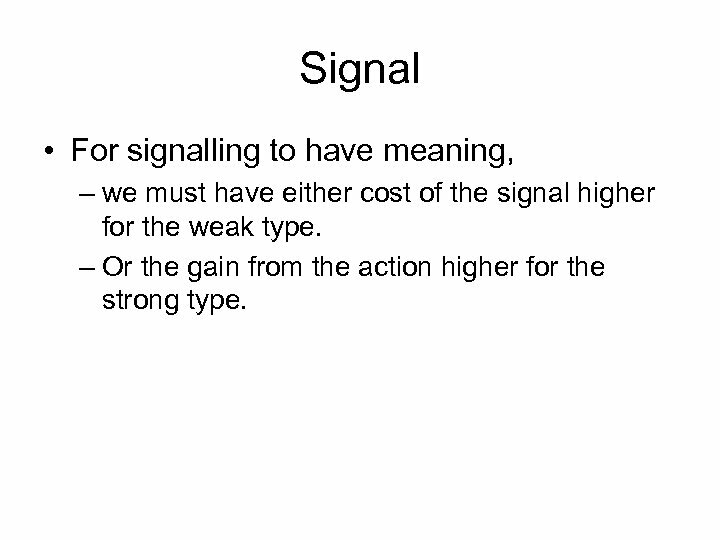 Signal • For signalling to have meaning, – we must have either cost of the signal higher for the weak type. – Or the gain from the action higher for the strong type. 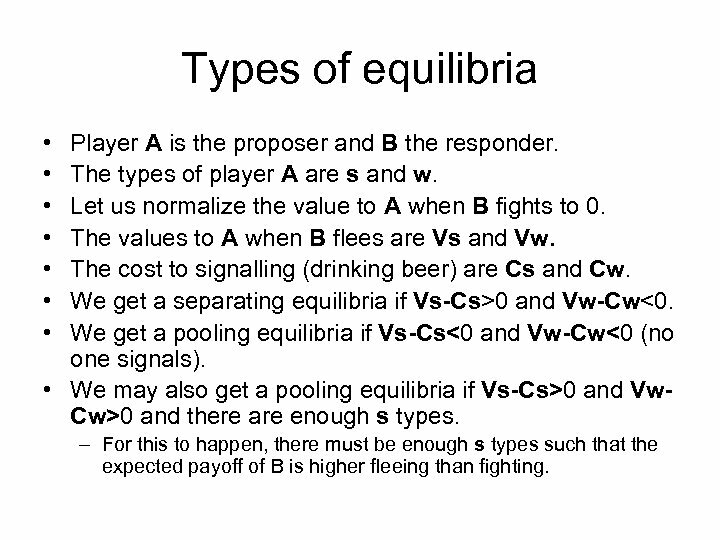 Types of equilibria • • Player A is the proposer and B the responder. The types of player A are s and w. Let us normalize the value to A when B fights to 0. The values to A when B flees are Vs and Vw. 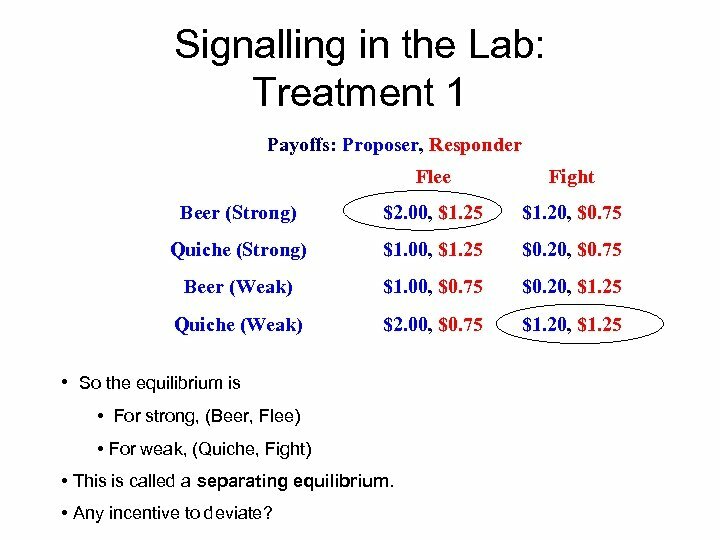 The cost to signalling (drinking beer) are Cs and Cw. We get a separating equilibria if Vs-Cs>0 and Vw-Cw<0. 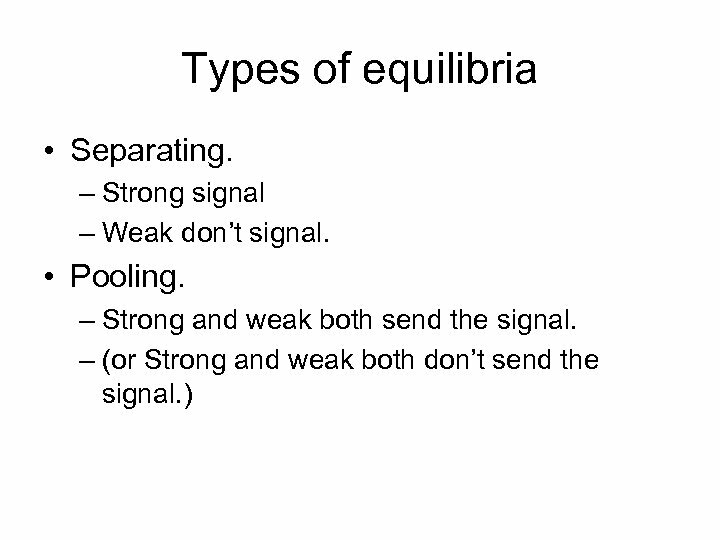 We get a pooling equilibria if Vs-Cs<0 and Vw-Cw<0 (no one signals). • We may also get a pooling equilibria if Vs-Cs>0 and Vw. Cw>0 and there are enough s types. – For this to happen, there must be enough s types such that the expected payoff of B is higher fleeing than fighting. Treatment 2: Other pooling? . 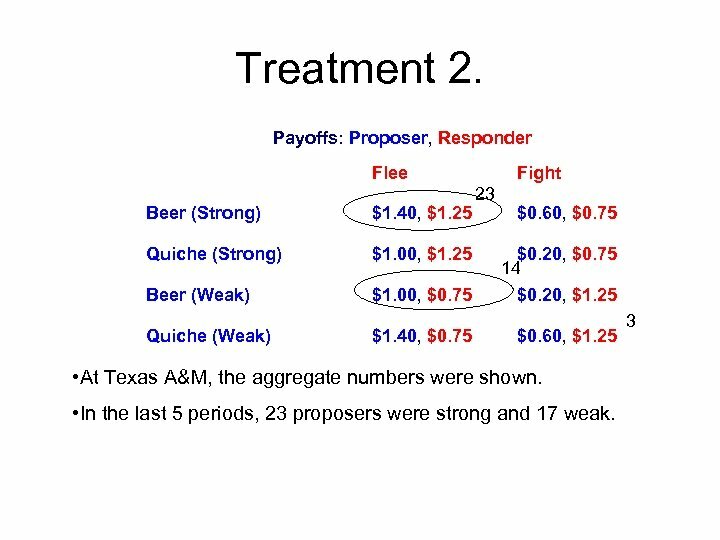 Payoffs: Proposer, Responder Flee Fight Beer (Strong) $1. 40, $1. 25 $0. 60, $0. 75 Quiche (Strong) $1. 00, $1. 25 $0. 20, $0. 75 Beer (Weak) $1. 00, $0. 75 $0. 20, $1. 25 Quiche (Weak) $1. 40, $0. 75 $0. 60, $1. 25 • How about both proposers eat quiche and the responder flees? Is this an equilibrium? • If responders think anyone who drinks Beer must be weak. • Cho-Kreps introduce an “intuitive criteria” that says this does not make sense. • Any proposer drinking Beer must be strong, because the weak type can only lose from doing so. How does this relate to gift giving? • Gift giving can be wasteful. (Why not give $$$? ) • Basically, you get someone a gift to signal your intent. • American Indian tribes, a ceremony to initiate relations with another tribe included the burning of the tribe’s most valuable possession. 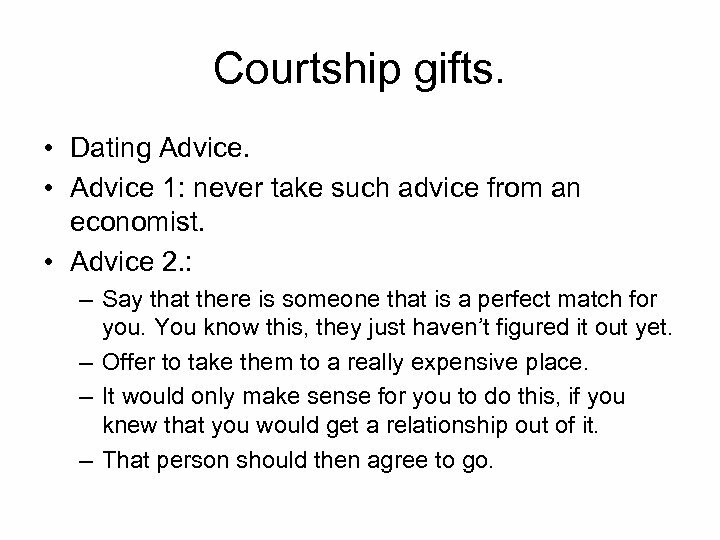 Courtship gifts. • Dating Advice. • Advice 1: never take such advice from an economist. • Advice 2. : – Say that there is someone that is a perfect match for you. You know this, they just haven’t figured it out yet. – Offer to take them to a really expensive place. – It would only make sense for you to do this, if you knew that you would get a relationship out of it. – That person should then agree to go. Valentine’s Day • Who bought a card, chocolate, etc? • We are forced to spend in order to signal that we “really” care. • Say that you are either serious or not serious about your relationship. • If your partner knew you were not serious, he or she would break up with you. • A card is pretty inexpensive, so both types buy it to keep the relationship going. • Your partner keeps the relationship since there is a real chance you are serious. 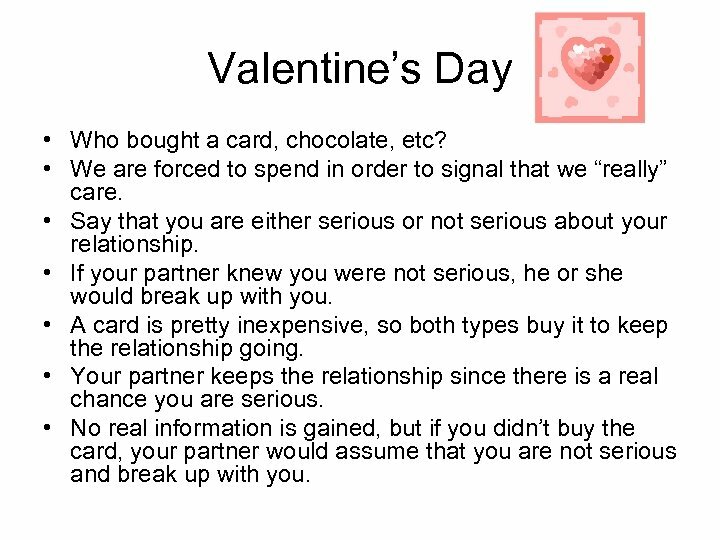 • No real information is gained, but if you didn’t buy the card, your partner would assume that you are not serious and break up with you. 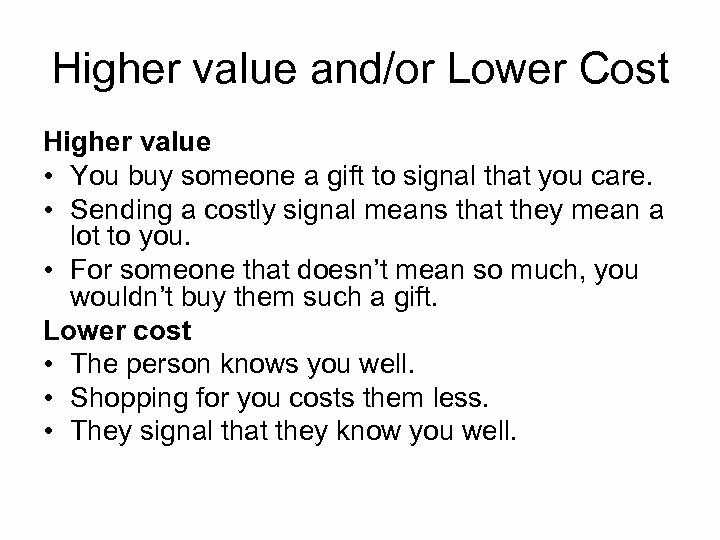 Higher value and/or Lower Cost Higher value • You buy someone a gift to signal that you care. • Sending a costly signal means that they mean a lot to you. • For someone that doesn’t mean so much, you wouldn’t buy them such a gift. Lower cost • The person knows you well. • Shopping for you costs them less. • They signal that they know you well. 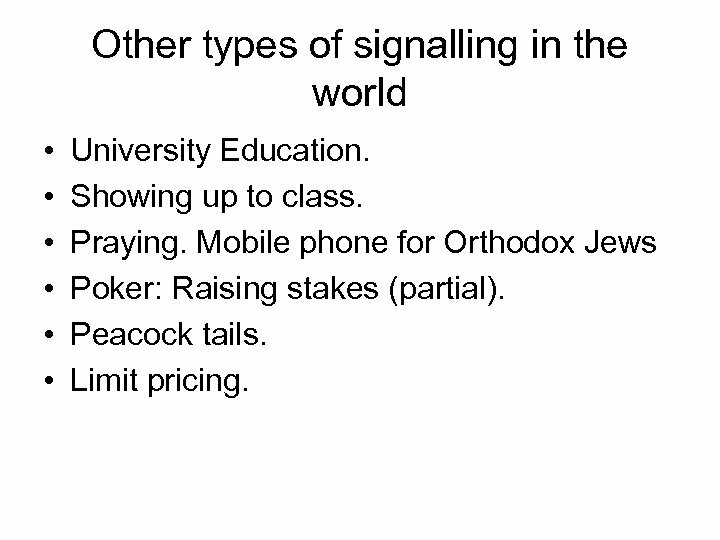 Other types of signalling in the world • • • University Education. Showing up to class. Praying. Mobile phone for Orthodox Jews Poker: Raising stakes (partial). Peacock tails. Limit pricing. Homework • 2 Questions are due on Friday, Oct 24 th. • Links them and how to submit them are from the webpage.